Panels are floatable/dockable panels designed to cut down on the number of pop-up windows within Cytoscape and to create a more unified user experience. There are five panels that can be visible or hidden. 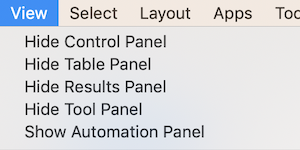 Each panel typically contains multiple tabs. For example the Control Panel contains at a minumum the Network, Style, Select and Annotation tabs. The Table Panel contains the Node Table, Edge Table and Network Table tabs. 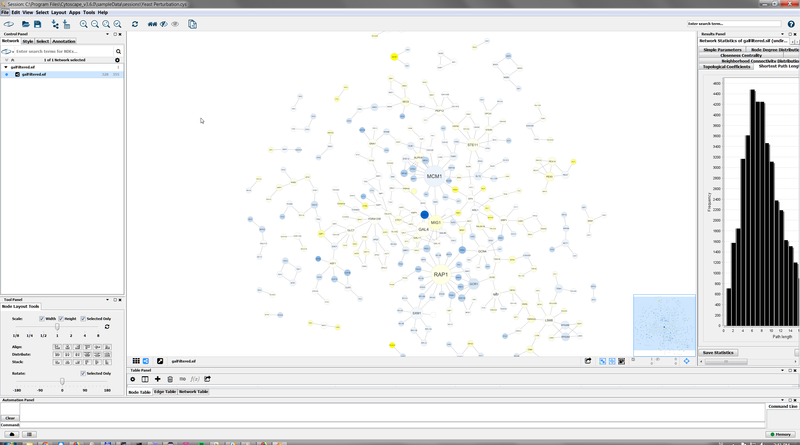 Analysis results from Network Analyzer (Tools → Network Analysis → Analyze Network) are shown in Results Panel. Installed Apps may add additional tabs. All panels can be shown or hidden using the View → Show/Hide functions. By default, only the Control Panel and the Data Panel will be shown. 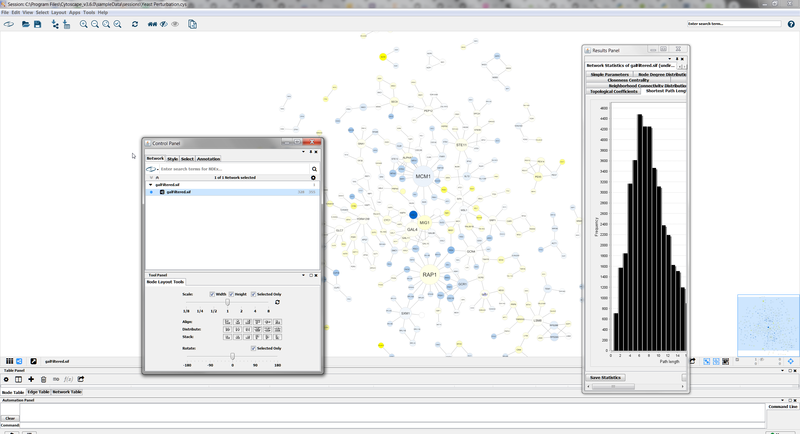 The Results Panel may appear, depending on the mix of Cytoscape apps that you currently have installed. The Tool Panel will appear when you select the following commands under the Layout menu: Rotate, Scale, and Align and Distribute. In addition, Panels can be floated or docked using icon buttons at the top right corner of each Panel. The Float Window control will undock any panel which is useful when you want assign the network as much screen space as possible. To dock the window again, click the Dock Window icon . Clicking the Hide Panel icon will hide the panel; this can be shown again by choosing View → Show and selecting the relevant panel.